2. Adhere the 3×5 paper, over the 4×6. 3. 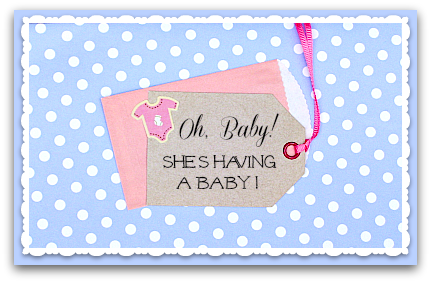 Print baby shower announcement on a 2.5×2 blank tag, or card. Add ribbon or bakers twine (optional). 5. Glue a pre-made, mini envelope in the center of the invite. 6. Layer tag on top of the mini envelope. Fold extra length of ribbon over back of card, and tape. 7. Glue printed 3×5 to the back of the card. This should cover the tape and ribbon. 8. Add a sticker or embellishment to the front of the invitation. 9. Cut, or buy an antique border for edging (optional). 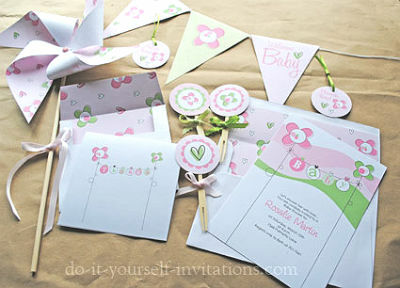 Homemade Baby Shower Invitations will take some extra time but, they can be worth it. Especially, if you’re a crafty person. Chances are, you have some craft supplies on-hand already. Plus, you probably have the experience and creativity to make a beautiful card that mom-to-be will love. You can get the supplies you need at a craft store. Measure approx. 12 inches of ribbon. The width of the ribbon can vary. The fabric blend of the ribbon can vary as well. Grosgrain ribbon is usually the easiest to work with. Cut and heat seal the ends of the ribbon to prevent fraying. Heat sealing, refers to carefully and directly, applying heat to the end of the ribbon. The small fibers of the ribbon, melt, or bond together. This will prevent fraying. Using fabric glue is another option for sealing the ribbon ends. Fold card stock in half to form a 4×6 card(it can be smaller-the size of the invite is up to you). Next Step: Find the center of the invitation, apply a small amount of glue, and lightly apply ribbon. Keep adding glue and ribbon until you have gone all the way around the card (be sure to keep ribbon straight). Now, go back and press the ribbon down to make sure it’s secure. Fold the left-over ribbon to make a small tab-secure with glue. Place a small piece of Velcro to create a closure. You’re done! Tip: Always plan on having a few extra invitations on hand.Friends or Family may be added to the guest list or your guest of honor may want an extra invite for herself. Frame an extra invite, and gift it to mom-to-be. 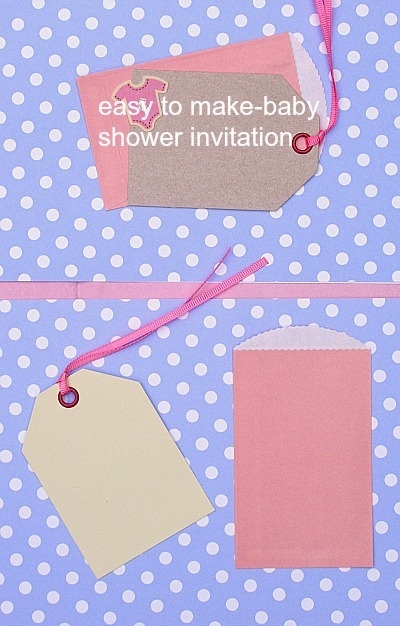 This Baby Shower Invitation Idea is also really simple.This invite can be used for various themes. Such as, a Tea Party or Girls Night for a Mod Mom… As with any of the invitations, you can make smaller thank-you cards to match. Pipe Cleaners or beading wire (and beads to string on the wire). Ribbon, Fabric, or patterned paper. Fold your card stock to size. Round or shape corners of the card (if desired). One suggestion I have: place your wording on the inside of this invite, rather than the outside. Prepare a paper template that can be attached to the inside the invitation. Bend your pipe cleaner into the shape of a purse handle. Leave enough length so the ends of the pipe cleaner can be attached to the inside seam of the card. Bend the pipe cleaner in half, then shape it into a purse handle. 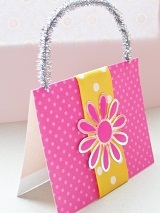 Attach the ends of the purse handle to the inside seam, or fold of the card (see image). Allow the glue to set and dry. Glue your prepared insert to the inside of the card. For a polished look, be sure the paper insert covers the pipe cleaner ends. Decorate the outside of the invitation with bows, bling or the initials belonging to mom-to-be.